If you live in an older home and your kitchen is beginning to show signs of age but you don't have a lot of money to spend on remodeling, don't despair. There are many things you can do to bring your kitchen up to date and back to life without spending a lot of money in the process. Here are just a few tips for remodeling your kitchen on a budget. A simple facelift can do a lot to renew a kitchen. Nothing improves the look of a kitchen more than painting worn-out wooden cabinets. 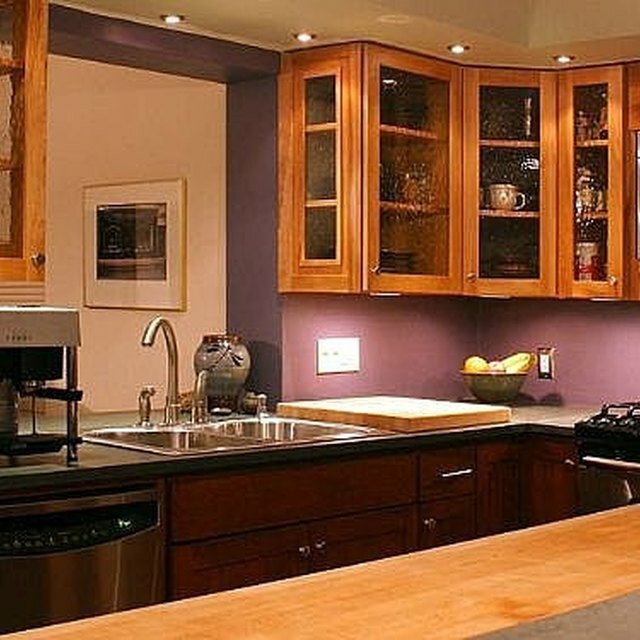 If your kitchen is dark and your cabinets old fashioned, all you have to do to bring them back to life is remove the hardware, paint the doors and boxes, and install new, updated hardware. Choose a light color to brighten up the room, and be sure and use a paint with a hard, washable finish, such as alkyd gloss. You might also consider refacing your kitchen cabinets instead of painting. This is more expensive than painting but less expensive than replacing the cabinets. Often, older cabinets are built better than new ones, and they may go all the way to the ceiling, where newer ones do not, giving you more storage space. Replace the flooring in your kitchen or add large area [rugs](https://society6com/rugs?utm_source=SFGHG&utm_medium=referral&utm_campaign=8775). New flooring can be very expensive, but you can purchase inexpensive vinyl flooring or, if you have a small enough kitchen, using a remnant of a more expensive material. Look for sales on discontinued flooring at home centers and flooring dealers. If new flooring is out of your budget, buy one large, inexpensive area rug to brighten up your kitchen. Shop online classifieds, such as Craig's List, for bargains on used items. Remove tired curtains from the windows, leaving the windows uncovered for a brighter, more open lookThis also will save you the expense of replacing old curtains. If you want to add a window topper or valance for color, you can find reasonably priced pieces at discount stores or during sales at large department stores. If you're handy with a sewing machine, make them yourself. Renew kitchen walls and ceiling with a fresh coat of paint. Choose a light color to make a small kitchen look bigger. If you have wallpaper on the walls, remove it and paint rather than replacing the wallpaper. Paint is more popular than wallpaper now and can give your kitchen an updated look. It is also cheaper to paint. Use a quality semi-gloss paint so you can easily wash your walls when necessary. Improve and update the lighting with new fixtures. Fixtures of all types can be found at very low prices. Consider ceiling-mount fixtures for general ambient lighting, undercabinet fluorescent fixtures for task lighting, and pendants or other decorative fixtures for accent and mood lighting. After removing wallpaper from the walls, be sure and wash them thoroughly before painting. When giving an old kitchen a face lift, lighter colors will make the kitchen look bigger. Look for sales on quality home improvement materials that will last rather than buying low quality inexpensive materials.